Don’t break the bank in the name of beauty. If you’ve shopped at any big box stores recently, you may have noticed beauty departments are starting to carry a bunch of lesser-known and “indie” brands, which makes it easier than ever to try new things. I grabbed four new-to-me products on a recent Target run (I was only supposed to grab toothpaste – oops.) and decided to try them out, then share my thoughts with you all. The best part? Each product rings in at under $6! Scroll down to see them all. 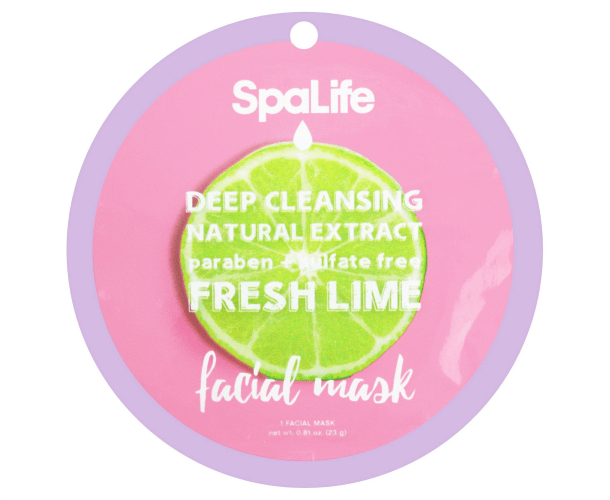 This sulfate and paraben-free paper facial mask uses lime extract, a natural astringent, to help deep cleanse pores. The instructions recommend leaving it on for 10 to 20 minutes, then rubbing in any excess product. The fun, colorful packaging is what drew me in, and that vibrant color continued right to the mask. It was pink! This product was so easy to apply and included a ton of serum, so I found it to be a great value. After 20 minutes, my skin felt refreshed and was practically glowing. The glow-y look was awesome, but after 30 minutes my skin took on a tight, almost sticky feeling that made me want to rinse off the excess product, ASAP. Also, I found the “natural extract” claim on the packaging to be kind of misleading. Yes, it actually includes lime, but also a laundry list of other ingredients like glycerin, polysorbate 80, and xanthan gum. I’m on the fence. Though I did like this more than other paper masks I’ve tried, it doesn’t feel like it really did anything to clear my pores. However, since the price is so low, I would be up for trying other SpaLife masks to see if they carry a better option for my skin type. 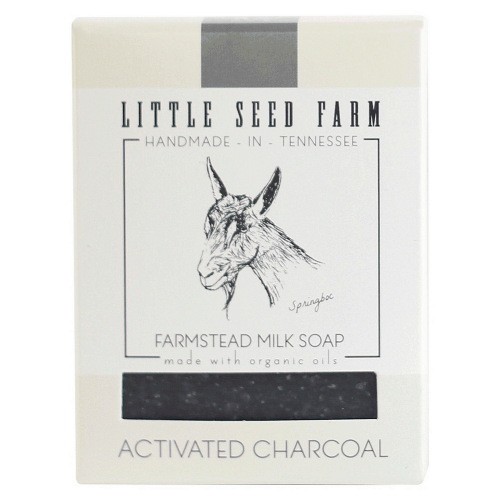 Handmade in Tennessee, this soap includes goat’s milk, activated charcoal, and other organic and natural ingredients. It’s formulated for sensitive skin and is GMO, paraben, gluten and fragrance free. Unlike many other soaps on the market, this one contains familiar, easy-to-read ingredients: virgin organic olive oil, organic coconut oil, grassfeed goat’s milk, sodium hydroxide, and activated charcoal. The goat’s milk in particular made my skin feel super-moisturized, and this product has not irritated my sensitive skin. I had high hopes this soap would help to clear up my hormonal acne, and it didn’t disappoint. I’ve been using it for a month so far, and although my skin isn’t 100% cleared up, my breakouts are less frequent and the ones I do get are smaller and heal more quickly. IMO, this soap is bulky and sort of hard to handle in the shower, and it dissolves down quickly, even when placed in a draining soap dish. It’s also not quite as convenient as shower gel/face wash, so that may be something to consider if you’re using a communal bathroom. Yes, yes, and yes! I love what it’s done for my skin and am planning to purchase another bar in the near future. I recommend giving this soap a shot if you have acne-prone skin. Sidenote: Though it’s not vegan, the packaging states the milk comes from a “humanely and sustainably managed herd of grassfeed goats.” I peeped their social media accounts and Little Seed is pretty transparent about their farming practices/open to answering any questions. Just FYI! 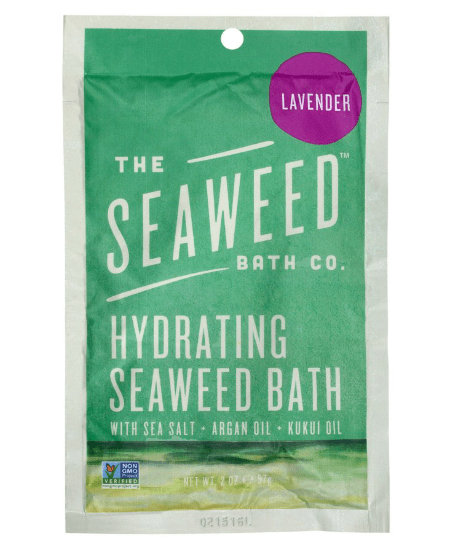 This bath powder blends sea salt, hydrating oils and organic, vitamin and mineral-rich bladderwrack seaweed. It’s GMO-free and the seaweed is sustainably harvested off the coast of Maine. All you have to do is add it to your bath, then swirl it around. The instructions recommend soaking between 15 and 30 minutes. After you use this, you’ll feel like you just spent the day at a spa. Seriously! My skin felt soft, moisturized and completely refreshed. It’s the perfect product to use if you just need to relax and zone out in the tub after a hectic day. Oh my gosh, the seaweed odor on this one was overpowering. If you’ve ever been to the beach during low tide, then you’ll know exactly what my bathtub smelled like. I thought it completely covered up the lavender scent. Also, if you are seeking an Insta-worthy bath snap, you may want to skip this one. The seaweed turns the water a murky shade of brown. Most likely. Yes, the seaweed smell on this one wasn’t my fave, BUT my skin felt so amazing afterwards that it was totally worth it. If I buy it again, I plan to use a few drops of essential oil to try and mask the scent. 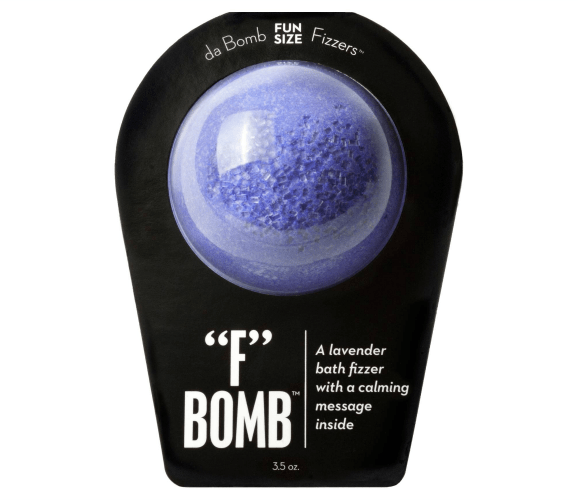 The “F” Bomb is a lavender-scented bath bomb that’s oh-so easy to use. Just toss it in the bathtub and watch it fizz away. The name, obviously! I also liked the little surprise included at the center of my bomb. It was a cute, uplifting message. And unlike the previous item, this one does turn your water a gorgeous shade of purple, so snap away. Also, the story behind this company is so inspiring. It was founded by two now-teenaged sisters when they were just 10 and 11 years old. I remember reading an article about them a few years back, so I was pretty excited when I saw this item at the store. Maybe I’m just weird about scents, but I absolutely hated the smell of this bath bomb. I was expecting a subtle, natural lavender smell and instead was hit with a strong, artificial, perfume-like scent that lingered long after I drained the tub. It’s worth noting that this is a “fun size” bath bomb, so it was on the small side. In fact, it was completely dissolved after a minute or so. Probably not. Though the concept is fun, it didn’t really do anything for me, so I can’t see myself dropping another $5 on one. If you do like bath bombs though, give it a shot. You may like it more than I did. What new bath products have you tried recently? Have you tried any of these? Would you like to see more articles like this? Let me know what you’re thinking and leave a comment down below.